All Alaska fishing vacations should be spent at one of the Alaskan Sportsman’s Lodges. Whether you would like to fish on the shores of the Naknek River or perhaps the Kvichak River, we guarantee that you will enjoy an amazing adventure that has five star luxury mixed with rustic outdoor flavor that you will never forget. For everyone looking for genuine Alaska fishing vacations in wilderness settings you only see in movies, look no further. Our lodges are the destinations for you. The Alaskan Sportsman’s Bear Trail Lodge is on the world-class waters of the Naknek River and only 14 miles downstream from the Naknek Lake. This river is full of salmon, and was named as the top river for Rainbow Trout by Fish AK Magazine. We offer not just one, but two premier 5 star luxury fishing lodges that are perfect for all types of Alaska fishing vacations. The giant cedar Alaskan Sportsman’s Lodge rises tall above the pines of the Kvichak River, very close to Lake Iliamna. 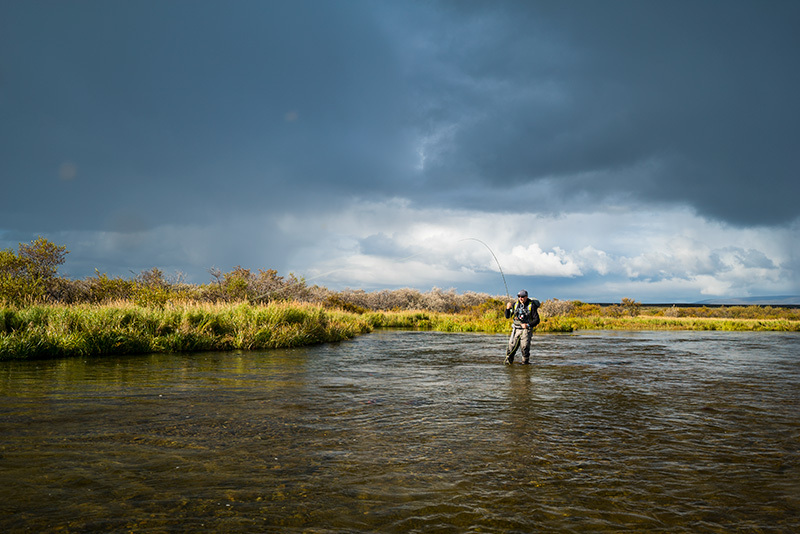 The Kvichak River is known as Alaska’s number one area for trophy Rainbow Trout and when you fish its waters, you will see why. We are located 250 miles from Anchorage. The Kvichak River is the only passageway for millions of salmon trying to return to their freshwater mountain home – Lake Iliamna. This means that ALL of these salmon must pass right past the front door of our lodge as they make this journey. As you can imagine, our guests at the Alaskan Sportsman’s Lodge catch A LOT of salmon without even having to leave the grounds of the lodge!! We have another 5 star luxury fishing lodge that is also located in a remote region of the Bristol Bay region of Alaska. The crystal clear mountain fed waters of the Naknek River flow right in front of The Alaskan Sportsman’s Bear Trail Lodge. This lodge is placed in the wilderness of the Alaska backcountry, just miles away from the confluence of the King Salmon River and Naknek Lake. All 5 species of Salmon inhabit these waters, making our front yard full of prime salmon runs.